We're still catching up and feeling motivated after an action-packed 2 days in Plano, TX! “This was our first time to a BLR Forum Event; I guarantee you that it won't be our last! This format was so much more focused on our interests and needs and was extremely productive for us compared to the strict exhibition/expo style conference…Kudos to the Forum Event team for an outstanding, enjoyable event (Casino night was the greatest! )” – CEO of AlgEternal Technologies, Inc.
“Great event - well planned and organized. Immense opportunity to network with peers and the workshops were informative and thought-provoking. The ability to select and have designated time with vendors was extremely productive. My first time attending, and I would attend again as well as recommend to colleagues.” – Safety and Worker’s Compensation Specialist at DAVACO, Inc. The Total Security Summit is launching an IT/Network Security sector as part of the 2016 event program headed by Event Manager and Specialist Xavier Chance. By adding IP and IT security to the list of areas covered, the Total Security Summit will become a more inclusive event focusing on topics ranging from physical security to IT, including audit security, computer network security, data security and information security management. With a background in communications, Chance has experience in numerous industries including human resources, training and development, contact centers, customer service, and physical security. His interest in new technologies and solutions makes him the perfect candidate to drive the latest addition to the Total Security Summit. “With technology advancing at a fast pace, we need to be prepared for any security threats. By focusing on IT Security, I want to bring in new ideas that can lead to solving the security threats of the present and the future as well,” says Chance of the new expansion. The Total Security Summit is a complimentary appointment-based event for senior-level executives in the security industry. The Summit hosts one-on-one meetings between solution providers and security executives based on their profile, along with a seminar program and numerous peer-to-peer networking opportunities. See upcoming dates below and click the link to register. For more information on how you can attend as a solution provider, click here. The Total Security Summit will take place on November 9th and 10th at the Westin Chicago Northwest. 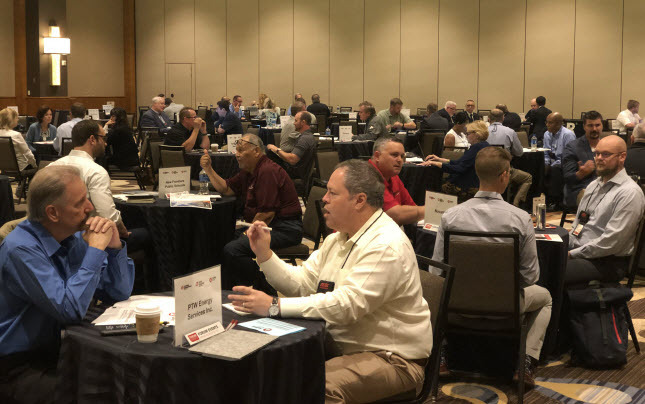 Security executives from the Midwest region will meet with solution providers at the appointment-based event to discuss upcoming projects and sourcing needs. A seminar program running alongside meetings throughout Monday and Tuesday will cover topics like new corporate security trends, biometrics, fire protection and social media for corporate security. All speakers are renowned for leading the security industry and will share their experiences during 45-minute seminars. The Westin Chicago Northwest is the perfect back drop for professional networking over complimentary meals and breaks at the Total Security Summit. Located just a stones-throw from the city, this venue provides a luxurious, laid-back setting for executives to connect with their peers and solution providers. The summit hosts a selection of sponsors covering a wide variety of services from access control to thermal imaging and audit security. Sponsors include Assa Abloy, Avigilon USA, Brightforce Software, Detex, Key Tracer Systems, Morse Watchman, Snaptrend, Video Insight, World Compliance Technologies, L-3 Communications, Milestone Systems, API National Service Group and Designed Security, Inc. Delegate attendees include executives from Domino's Pizza, American Lending Solutions, Bob Evans Farms, Boeing, Cardinal Health, Cherokee Nation Entertainment, Conde Nast, the Detroit Lions, Justice Stores, Mattel, Inc., Navistar, United Airlines, Trump Hotels and Walgreen Co., just to name a few. The Total Security Summit is pleased to announce a new media partnership with Correctional News, a publication by Emlen Media. Founded in 1994, Correctional News is the only news magazine specifically dedicated to correctional facility construction, maintenance and operations. Correctional News readers include facility operators and managers as well as architects, contractors and suppliers. “Correctional News covers just one of the many facilities we invite to the Total Security Summit, however they offer vital industry news and product features making them a knowledgeable source for security professionals,” says Yasmin Parsloe, Director of Communications at Forum Events. The Total Security Summit is taking place on November 9 & 10, 2015 in Chicago, IL. Complimentary registration is available to qualifying senior-level security executives who are currently sourcing projects to network with solution providers in a one-on-one setting, attend seminars and network with other C-Level peers. For more information on the Total Security Summit, contact Event Manager Cherissa Irvin at cherissa.irvin@forumevents.com. “It was pleasantly surprising. I liked the relaxed atmosphere.” – Fiesta Mart, Inc. The Total Security Summit dodged flash floods in the Houston Galleria area in the first week of June. As security directors from the area gathered at the JW Marriott, the skies cleared, setting the scene for the first Total Security Summit of 2015. Delegate attendees, including security directors from Amazon Web Services, American Airlines, Atlanta Braves, Greyhound Bus Lines, Justice Stores, Michelin North America, City of Austin, Starbucks Coffee Company and University of Chicago Medicine, met with providers for a total of 795 combined meetings over the day-and-a-half with solution providers including Assa Abloy, 3M Building Company, Detex, CAP Index, Avigilon, Snaptrends and Axis Communications. “This was extremely well done. Enjoyed the format, the pace, the flow. List of delegates was excellent. Avigilon has absolutely added revenue to the pipeline, established new relationships and even bolstered old ones. Will definitely be at the next event,” says Avigilon, who attends numerous summits, including the most recent in Houston, Texas. Delegate attendees made new connections while also learning about new solutions as part of the seminar program at the summit. 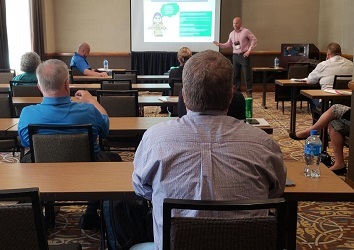 For both first-time and return attendees, the event was an intimate networking and educational experience, Amazon Web Services reporting "[The Summit was] very educational and gave good insight. I was able to talk to vendors about product modifications for possible solutions.” For many attending security directors, the format made for a comfortable and relaxing event, "I appreciated the method of vendors coming to your table and the established schedule," says UT System Police, meanwhile Fiesta Mart, Inc. applauded the "relaxing atmosphere." Following the event, the Forum Team has received feedback from delegate attendees and all have reported they intend to do business with at least one connection they made at the summit. Patrick Hayes (SCF, QSA) is a confirmed speaker at the Total Security Summit taking place in Houston, Texas on June 1 & 2, 2015. Hayes will host the “Trust Modeling for Cloud Outsourcing” seminar which will give insight into current and relevant issues impacting organizations and threatening the security landscape. Hayes is a certified Enterprise Security Architect and PCI-DSS QSA. He is also a seasoned business leader with over 20 years of experience in Information Technology strategy. During the course of his career, Hayes has operated in several key senior technology and operation roles accountable for strategic direction, organizational alignment, and execution. He recently served as Chief Information Officer for IC Group LP, and Managing Director for AT&T Canada’s Consulting Services. Currently, he is responsible for the US operations of Seccuris, a leading information security consulting and managed services firm. Hayes is focused on preventing the level of potential attacks, breaches and dangers an organization’s vital information is faced with. It’s imperative to have an effective security program in place, especially where cloud applications are involved. Hayes will give insight into how to create protection and compliance solutions capable of reacting to any real or perceived threat at any point in time. To register for Patrick Hayes’ seminar, join the Total Security Summit in Houston, Texas. Complimentary registration is available here. The Total Security Summit, taking place on June 1 & 2, 2015 in Houston, Texas, is rolling out key seminars for security executives. With topics including “Surviving an Active Shooter,” and strengthening physical barriers using access control, these informative 45-minute sessions allow executives to share their security knowledge in an open discussion format. Senior Community Liaison of the Houston Police Department Stephen Daniel will host an active shooter seminar at the summit. During his presentation, he will provide a historic overview of active shooting in America, unveil the profile of an active shooter, cover response practices for an active shooter situation and use case studies to develop the best strategy for responding security officers. Also unveiling a new seminar, Steve Surfaro, Industry Liaison, Axis Communications Chairman and ASIS International Vice Chair, will give insight into the power of social media and security technologies. Social media conversations have implications for a range of organizational functions including security operations. Understanding and reacting to those conversations can improve intelligence and provide security personnel with valuable information to assist in securing persons, property and assets. This session provides case studies of security successes through the use of trending security technologies, mobility and the Internet of Things. Terry Gold will host two seminars on access control and card technology. Gold is a subject matter expert in digital identity management, authentication, and access control in both physical and information-based environments. He is the founder of IDanalyst, a vendor-neutral research and advisory firm specializing in identity management, credentialing and privacy. His firm provides guidance to end users on vendor and market capabilities, best practice for selection and methodology for deployment. Attendance in the Total Security Summit Seminar Program is included for qualifying security executives for free. To participate in the summit and these seminars, register here. Your complimentary registration includes attendance at the summit, a personalized itinerary of meetings and seminars, accommodation at the JW Marriott Houston, and all meals and refreshments. For more information, contact Event Manager Cherissa Irvin at cherissa.irvin@forumevents.com, or by phone at (941)925-7585 ext. 107. When it comes to advancing your career in the security industry, certifications can set you apart, but how much do they really influence your career path? A recent study finds that there are 117 different certifications issued by 46 separate organizations. Of these certifications, the most highly requested one is the Certified Protection Professional Certificate (CPP) issued by ASIS – mentioned in just 5.5 percent of security job listings. The debate over certification in the selection process for high profile security roles is very controversial, but just how important are these credentials? With certificates in various sectors of the security industry, including approximately 67 security generalist certificates, 15 crisis and disaster recovery certificates and 35 cyber and technology certificates – there are numerous opportunities for security experts to advance their credentials. Security staffers holding certifications tend to make more than twenty thousand dollars higher than the average staffer without credentials. This higher payscale should be reason enough. Why wouldn’t you add an extra pin to your lapel? According to a Security Workforce study, 70 percent of respondents view certificate recognition as a reliable indicator of competency when hiring, and almost half require certification. Perhaps you are looking to advance in your career? Relocate? By adding these certificates to your resume, you are making yourself more apparent to recruiters who use robots and spiders to crawl applications. By entering a long list of keywords, often including certifications, recruiters are able to scan the internet for candidates, putting you on the fast-track for electronic screening. By earning a qualification, you become part of an exclusive club – a group of professionals who have earned the same certification as you. While it may not be a luxurious country club, this new certification allows you to network with like-minded individuals in your industry – opening up a whole new window of opportunity. Be sure to not write off a security expert who doesn’t have those few letters after his last name. Experience can often speak louder than certifications, but combined, can be unstoppable! Fewer than one in 10 people read the terms of services of new applications. This is if Facebook didn’t recently announce that all users are being forced to download the standalone Messenger App in order to send or receive messages on mobile devices. Following Facebook’s emotion manipulation study – users are now questioning their personal security when connecting with friend’s on the social network. You are allowing the app to call phone numbers without your discretion. This may result in unexpected charges or calls. You are allowing the app to send SMS messages. This may result in unexpected charges. You are giving the app permission to record audio with the microphone on your phone without you knowing. You are also allowing the app to take pictures and videos using the camera of your phone without giving you notice. You are also giving the app access to your personal profile information stored on your device such as your name and contact information. Among other information the app can access on your mobile device: your call log, SMS text messages, contact data and emails. Report: It would take you the average person 250 working hours per year to read every terms of service he encounters daily. This sudden awareness of policies and terms of service follows Facebook’s 2012 psychological experiment where Facebook altered the number of positive and negative posts seen on more than 700,000 users’ newsfeeds finding that less positive words would lead to more negative posts. The manipulation of data lead Facebook’s chief operating officer, Sheryl Sandberg, to admit that Facebook “communicated poorly” about the study. It is important to note Facebook Messenger is not the first freestanding app to pose such requests. Using any messenger app, including WhatsApp, Viber, MessageMe, are likely to have similar permissions. Employee Theft: Stop the theft or build the bottom line?